These were so good. Owned a model 2 and later the blue model 3 Selectric. The typewriter is long gone, but I kept an orange ink cartridge in its original box and couple of the golf balls for posterity. I don't use the "home keys" method anymore. But I do a mean hunt and peck. My soph year (1970) - there were probably 80 of us in one big room taking Typing 1 with our big heavy manual typewriters. In the next room, there were 20 Selectrics that Typing II got to use, as well as some of the more promising "secretarial types" - never any guys back then. I wasn't aware of sexism , but I sure know how much I coveted being on one of those nice electrics, especially when my pinkies were failing me again on "a"s and semicolons! That ball was the design inspiration for their building at the '64-'65 World's Fair. A great typewriter in its time. Envelopes were a pain though. 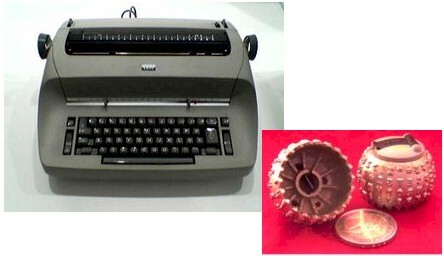 As a senior in high school in 1973, I would have killed for an IBM Selectric typewriter. Last June, I picked one up on eBay for $149.50. Refurbished and worked well. But why did I do such a dumb thing? Sold it to my sister and promised not to do anything that stupid again--lol !